Tales of a girl who stitches and knits, among other things. I had to go to Atlanta last week for work meetings. Honestly, you don't want to hear about them. I'll just say that on the whole, they were productive and move to what you really want to see and hear about....new stash! I had to stop by my favorite needlepoint shop In Stitches to pick up a canvas I had ordered and the next in a series of small canvases they had for me. The canvas was the first to be found and brought out. I had ordered this after seeing one in the shop that is similar, only the bunny is pink and sitting. Blue is more my color and I can't wait to figure out how to stitch this one. I'll be saving it for a class sometime later this year. Isn't it adorable?!?!?!? The gold is a bit sparkly, which is really cool. No idea how I'd finish it were I to ever get it stitched, but I'm sure I have plenty of time to figure it out. Very bright and has lots of potential for sparkly goodness. I don't have any Thanksgiving canvases, so I decided on Give Thanks and found threads that I liked to be able to start it at some point soon. I'm going to do some thinking and digging in some stitch books before I do anything. Try to figure out what fun stitches I should use. Finally I found a cute insert for one of the luggage tags so I went ahead and got that as well. I'll stitch my initial in the center and then it can be put in the tag that I bought but forgot to take a photo of. The rest of my stash enhancement consisted of buying some stretcher bars that I needed. And I might have had them order me another canvas that will hopefully be there when I go back to Atlanta next month. All in all a fruitful and fun trip after a week of work. I mean, I earned it right?? Who are the people in your neighborhood...your WIP neighborhood, that is? Give your people-populated Projects some face time this month. This month's ornament challenge, in keeping with the regular theme, was to stitch a snowman (or snow woman). I choose a kit from my vast stash. I think it turned out adorably. "Snow" by Glory Bee. I still need to make it into a proper ornament. One of my EGA 2013 Finishing Challenge pieces is "Christmas Adam & Eve". I made a little progress the few days I worked on it. At least it got the date in the bottom part so I can work on it at stitch-ins and I did put some more of the wording in. Although its on 40 ct so that might not work out well either. This pieces looks larger in pictures then it actually is. Since my RA decided to drive me crazy this month I decided to work on "Noah's Mantle". Didn't get a lot more done, but it's progress. I'm looking forward to seeing how this will look as it progresses. It's on 18 ct. fabric and is worked with perle cotton fibers. That's the round-up for the month. Sorry for the lateness. I keep blaming work, but that's really been a lot of the problem. I just got home from a week in Atlanta for work and maybe a few hours of fun. March Madness is here and that's going to be fun. I won't have TONS to show, but hopefully a thing or two. The ornament is 3-D...I'm still debating this one. I have an ornament I'd like to stitch that's in my stash of ornament kits. I'm going to pull it out and see how far I get on it. Hope everyone enjoys stitching in March! Many of my friends will tell you I'm usually running a bit behind, late if you will. I will admit that this is a little extreme. I really meant to be on time with my end of month round-up but as you can tell I didn't make it. I actually didn't have a lot more to snow from my mid-month post but here goes. I decided it would be fun to try and stitch an ornament a month with the ornament themes. I still have a few, ok closer to hundreds, of the kits from the Oranment Exchange I was part of with a group of far flung stitching friends. Since the theme this month included a tree I decided on this one.. The kit came from DF Heather, yes our own Theme-a-licious Heather. She used the free pattern from Rainbow Gallery and included all the really interesting fibers used. The fabric has a metallic thread though it. I can't wait to get this one finished. I had some lovely fabric in my stash for the back so now I just need to decide if it should be a pillow or flat finish and the embellishments. Another piece I decided to pick up was Christmas Adam & Eve by Notforgotton Farm. I purchased this at The Attic on a trip and changed the fabric, sorry I don't remember to what and I can't find the bag it was in. It calls for Antique White, but the people didn't show up so I liked this more khaki color. Another one I think will be fun when it's finished. Finally I made a start on Ellen Chester's Quaker Sampling III. I bought this to be a sort of companion piece to the other of Ellen's I did for my parents 50th Wedding anniversary. For those familiar with this piece you will immediately notice that I changed the fabric and the fiber color. The fabulous Drema at Needlecraft Corner helped me find the perfect blue fiber and a fabric to make it pop. I'm stitching on 36 ct Very Light Examplar with 1 strand of Gloriana 12 strand silk "Velvet NightSky". I'm in total love. I didn't make any further progress on the pieces I showed at the mid-month point. Oh, for those wondering, yes all of these are also part of my EGA chapter's finishing challenge. I'll show you the final ones later this month. The ornament will have to be completely finished before it can count as completed for the challenge, but for purely stitching it's my first finish of 2013! My RA has decided to flare up so this first part of February hasn't been as full of stitching. I have embraced the new monthly ornament theme and should have one finished with a snowman on it by the midpoint check in. Hope everyone else is having a better stitching month! The holidays were a little stressful...let's relax in a nice garden. Work on any piece with flowers or garden. Another year means another try at Theme-a-licious with my DF Heather. This year I'm getting off to a fairly decent start. This piece is a tad addictive. You pick it up to work on a square and boom, you finish that square and think "Ohhh, look I've accomplished something! Lets keep going!" I'm waiting to get bored with it. Hopefully that won't happen since this is the SAL (Stitch-a-Long) for 2013 with my EGA chapter. Look! A person! I'm excited I made so much progress on this piece. I'm amazed. This is one I'm planning on working into each month's theme. I'll have to be creative, but hey, that's the fun of Theme-a-licious! What's this "finishing" they speak of? Ok, so it's not a ton of stuff, but that's ok too. I finished one thing that had been in my WIPs for a very long time and two new things. Plus there's the "finishing-finishing" I did! 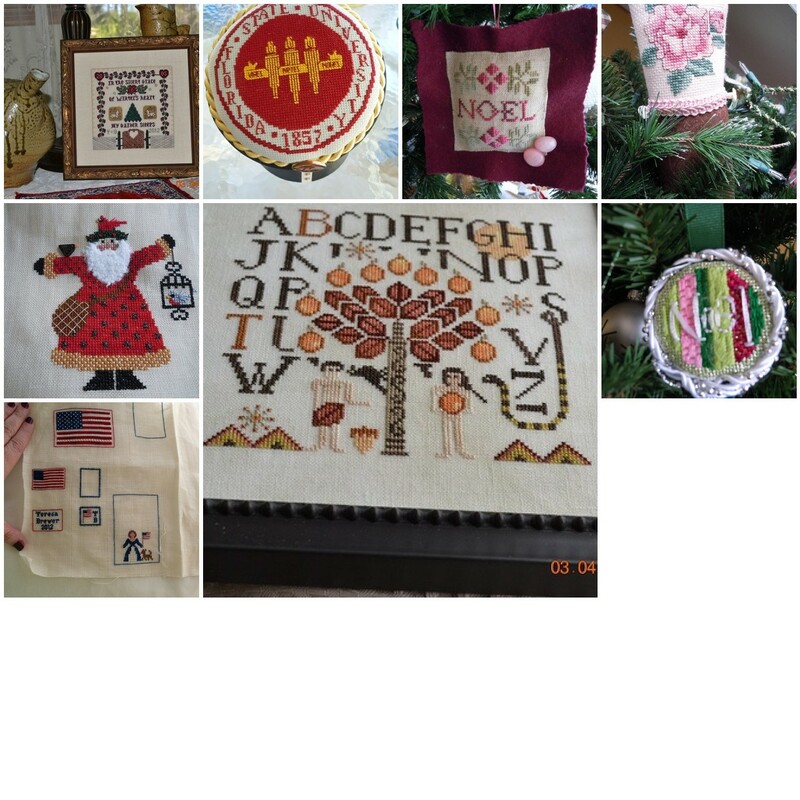 From left to right starting at the top: Winter Garden Gate (Moss Creek Designs), FSU seal (no idea the designer), Noel Ornament ( ??? ), Rose (no idea the designer), Feathered-Friends Santa (HeathStrings/The Artists Collection, JSC 2005 Orny edition), HallowEden (Plum Street Samplers), Noel (painted canvas), Long May She Wave (Ellen Chester). I included some things that I'm fairly certain I finished stitching before 2012 but did the actual finishing this year like the FSU seal and the Rose. The other ornaments I finished stitching this year and wow, even did the finishing for two of them. Winter Garden Gate has been in my WIPs pile for a long time. I even tried to finish it as a SAL with DF Heather a few years ago. Getting it completed in 2012 was fantastic. That makes 3 of the 5 Gates that Rae designed are complete and a wall in my house. When Heather came down to go to the Sun Region EGA stitching weekend with me last year we started another gate. Sadly I haven't worked on it since. With everything that went on in 2012 I'm pretty impressed I managed to do all this. I'm looking forward to 2013 and getting a few other things out of my WIP pile and hopefully some more ornaments finished. I've actually got a box full of ornaments I've stitched but haven't finished. I think I need some "finishing" days this year. Thus ends my look back at 2012. Now to look forward! To actually stitch a few stitches. I decided to make a start on the SAL my EGA chapter decided on for 2013. I have to admit that Toccata #1 was not my first choice, I was hoping for the canvas piece we had on the ballot. But that's ok, I'm game for a new project and this one looks interesting so I ordered my kit and got it before the New Year. I actually didn't have a lot of time to stitch. I spent part of the morning getting the linen ready, it needed a good ironing and then had to be mounted on some scroll frames. I decided to go ahead and put it on scrolls since the piece is pretty good size and there's pulled work in it. I need some tension for that kind of stitching. Then I was distracted, in a good way, by lunch with a friend. We decided to try out a pizza place in Orange Park that brews their own beer, and has a lot of other interesting craft beers on tap. We haven't had a chance to catch up and talk for awhile so that turned into a 4 hour lunch. That's my excuse reason for not having more done. I really only worked on it for a few hours. So, that's the first 2 items on my Finish Challenge list, there will be 8 more before the month is through. We'll see what else decides it wants to be finished to hang on the walls, or sit on a shelf, this year. I'm sure most everyone has given up on me ever posting to my blog again. I'll just say it's been a tough year. For those who don't know me IRL I had to have some major surgery this year. Things started taking a bad turn in January and weren't great until the surgery in August. The 3-4 week recovery time stretched to 7 weeks out of work. Thankfully I started a new job in March with a great company, working for a great boss who understood what was going on. Then a week after I was back at work my dad had to have a pacemaker put in. The good news is I think we've all settled down into a somewhat normal routine now. I might have been sick, but I still managed to stitch and knit some. I've got some pictures to regale you with a little later, not all at once. I mean, I wouldn't want to overwhelm you or anything now would I? Well that and I need to break out the camera and take some actual photos! My DF Jackie was over Friday stitching and watching season 1 of Sherlock with me and she saw some of my goodies all finished. She insisted I needed to get back to my blog and since I promised her, and DF Heather I would...and because I have a finish to share, today was as good as tomorrow to start back. Oh, the finish? You want to see? Well the picture isn't fab, I took it with my phone, but you'll get the idea. It's the completed stitching for Long May She Wave (now you get the title right?) by Ellen Chester. Ellen came to our duClay EGA Chapter earlier this year and taught this lovely piece. I can't believe I actually finished the stitching. I even went today to find the thread and other things I'll need to do the actual finishing. I had hoped to get started on it this evening, but I'm a little too tired to manage that. I'll try and work on it tomorrow. I'm very excited to get this accomplished as Ellen is headed back to Jacksonville to teach another class for us in 2013. I'm all signed up and it will be a first for me to finish one of the classes I've taken from her. I'm a sucker for anything with Mr. Tennant in it. And I like the themes too. So please come back and stay tuned. I'm getting back into the swing of things, catching up on my favorite blogs and hopefully things will stay sane, or at least what passes for sane in my life! Simply put I'm a single girl who's never been married and have no kids, so as someone said I have time to do the things that interest me. I work so I can enjoy my hobbies and travel. I'm a girl who stitches, knits, crochet and ever so rarely sews, hence the name of this blog. I also read, sometimes more then others and almost anything. This blog is my way of sharing all this with my family and friends (real life and cyber-life). New Projects in Woodworking and Art -- Spending time with my great-great nephews!